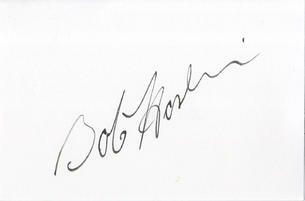 This is a Hand Signed white card 6" x 4" by the late British actor. Robert William "Bob" Hoskins, Jr. (26 October 1942 - 30 April 2014) was an English actor known for playing Cockneys and gangsters. He has appeared in films such as The Long Good Friday (1980), Mona Lisa (1986), Who Framed Roger Rabbit (1988), Mermaids (1990), Hook (1991), Nixon (1995), A Christmas Carol (2009), Neverland (2011), and his final role in Snow White and the Huntsman (2012). Hoskins was the recipient of the prestigious Prix d'interpretation masculine as well as winning the BAFTA Award for Best Actor in a Leading Role and Golden Globe Award for Best Actor - Motion Picture Drama for his role in Mona Lisa (and was nominated for the Academy Award for Best Actor) and an International Emmy Award for best actor for his appearance on BBC One drama The Street in 2009. He died on 30 April 2014 of Nervous Exhaust.